Seychelles President Danny Faure smiles during an interview with the Associated Press, on board the vessel Ocean Zephyr off the coast of Desroches, in the outer islands of Seychelles, April 13, 2019. Wearing a Seychelles T-shirt and shorts, the president told The Associated Press after his speech that the experience was “so, so cool. What biodiversity.” It made him more determined than ever to speak out for marine protection, he said. Seychelles President Danny Faure, left, sits inside a submersible on the deck of vessel Ocean Zephyr, off the coast of Desroches, in the outer islands of Seychelles, April 13, 2019. 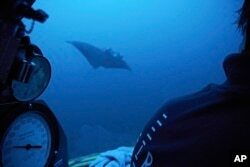 A manta ray swims near the submersible during a dive off the coast of the island of St. Joseph in the Seychelles, April 8, 2019.